The HNS shall be a professional organization devoted to furthering the discipline of neuropsychology with Spanish-speaking populations. For purposes of these bylaws, neuropsychology is considered to be a specialty of psychology committed to better understanding the relationship between brain functioning and behavior. The Society seeks to address issues of clinical care, education, and research matters relevant to the field of neuropsychology with Spanish-speaking populations. To promote the competent practice of neuropsychology with Spanish-speaking populations. To actively promote networking and collaboration among its members regarding the use of appropriate instruments and normative data for the assessment of Hispanics. To remain an independent and autonomous society in order to work collaboratively with existing neuropsychological organizations, both in the U.S. and abroad. 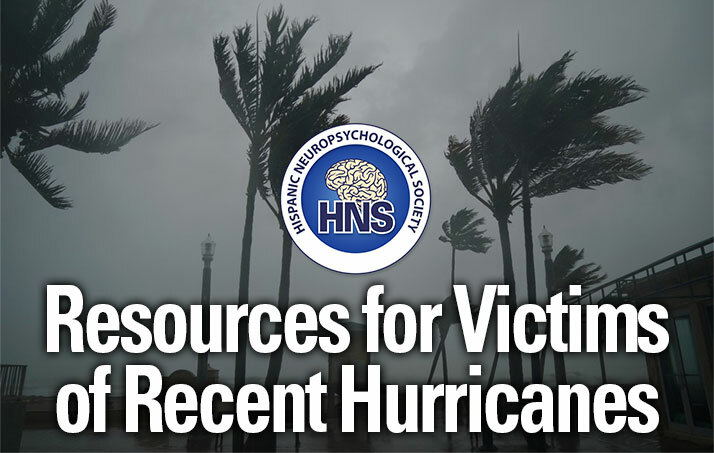 To positively impact the training of current and emerging neuropsychologists working with Hispanic populations via networking and mentoring, as well as providing support for research opportunities to improve the extant knowledge base. 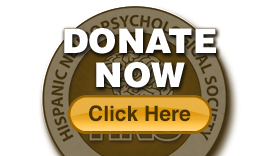 The membership of the HNS shall be composed of interested professionals who demonstrate a clinical or research interest in neuropsychology with Hispanics. Generally, these professionals will have a Ph.D. degree in psychology, in one of the neurosciences, in the field of Communication Disorders, or a degree as a physician (M.D. or D.O.) with specialty training in neuropsychiatry or neurobehavior. All members of the HNS shall be subject to the Bylaws of the Society and to any subsequent revisions or amendments. Fellow, Professional and Associate members shall have full vote and privileges, and be members of committees. Fellow and Professional members may hold elected office. There will be one Student representative on the Executive Committee. Except for the Student Representative on the Executive Committee, Student members may not hold office. However, students may be members of committees and may have voting privileges. Affiliate members may not have voting privileges or hold elected office. They may be members of committees. Institutional Partners shall have no voting privileges and will not have the right to hold office or be members of a committee. They can, however, be called to assist a committee as long as there is no conflict of interests. Applicants shall complete a membership application, together with sponsorship forms and other supporting data as requested by the membership committee. The membership committee, along with the executive committee will review each completed application and determine eligibility of the applicant for Admission to the Association. An affirmative vote by the majority of those on these committees will be required for election into the Association. In the event a candidate’s application is rejected, the candidate will be apprised in writing of the specific reason for the rejection. The applicant may appeal in writing directly to the Membership Committee for reconsideration with additional information. The Membership Committee will issue a summary of the issues and forward such application to the Executive Committee who will issue a final decision on the matter during their regular meeting. Membership status will be effective upon receipt of appropriate dues, if any dues are required. Yearly renewal of membership by the executive secretary will be automatic except when otherwise directed by the Executive Committee for one of the conditions stipulated under Section 5 of Article III (Membership). Any category of member of the Society may lose their membership status for one of the conditions outlined below. Charges of possible violations will only be entertained by the Executive Committee and/or Board if such charges are submitted in writing to one of the members of the Executive Committee. The Executive Committee will then refer the charges to the entire Board, which will confidentially investigate the validity of the charges. The charged member will be given the opportunity to meet with the Board prior to any final decision which could result in expulsion of that individual. Members may resign from membership status at any level by submitting in writing their wish to terminate participation in the Association. Members are not in good standing because of resignation or nonpayment of dues will be eligible for reinstatement upon written request to the Membership Committee. Each voting member in good standing shall be entitled to one vote on each matter submitted to a vote of the members. A member may vote by proxy executed by write-in vote executed by the member or his/her duly authorized attorney in fact or in person. No proxy shall be valid after 3 months from the date of this execution unless otherwise provided in the proxy. The dues will be required from each member of the HNS, in an amount to be set by the membership during the annual business meeting. The revenues from such dues will be used to support all legitimate business expenses of the organization necessary for its efficient operation. The fiscal year of the Association will be from January 1st through December 31st. Annual accounting of the finances of the HNS will be made public by the Treasurer to the membership during the official annual meeting. Dues are to be established by the Board of directors and will be noticeably printed in the official publications of the Society. Any increase in dues must be passed by 2/3 votes of the Executive Committee. Before the end of the fiscal year the Treasurer shall bill each member by mail or e-mail for forthcoming annual dues. In the event that the Association is dissolved, any remaining funds are to be dispersed to a cause/organization that promotes the specific objectives of the Society, or as voted by the majority of the membership and ratified by the Executive Committee at the time of dissolution. The duration of office terms will be two years, except for the President-Elect, Immediate Past-President, Student Representative-Elect, and Student Representative, which will be one-year terms. Except for the Treasurer, Secretary, and Members-At-Large, who may serve two consecutive terms holding their particular office, no officer may serve two consecutive terms. Except for the Secretary who may fulfill the duties of Treasurer, no person may hold more than one office at the same time. Members of the Society may nominate prospective officers for the Executive Committee. Self-nominations will be accepted. Nominations may occur during the annual business meeting, via email, upon request by the Membership and Elections Committee (Call for Nominations), or in writing (addressed to Membership and Elections Committee). Officers shall be elected by majority vote from eligible members of the Society. Voting may occur at the annual meeting (in person, or via proxy), or via email survey conducted by the Membership and Elections Committee. All Officers must be members of the Society in good standing, for at least two (2) years. The Student-Elect should either have been a member for one year, or has demonstrated active and meaningful participation in HNS activities. The Student-Elect must be in good standing. Student Representative-Elect: The Student Representative-Elect (SRE) will be present at the meetings of the Executive Committee. The SRE will support the mission of the HNS Student Association and assist the SR. The SRE is a non-voting member of the Board of Directors, and contributes student perspective and opinion. No Officer of the association shall deal with him/herself or any other Officer in a manner which represents a conflict or potential conflict with the interests of the association. Officers may recuse themselves from voting or any discussions that may cause a potential conflict of interest. Conflict of Interests statements will be gathered by the Secretary at the start of a calendar year. These statements are reviewed and approved by the Members of the Executive Committee, or at the first Executive Meeting or conference call thereafter. The Executive Committee of the HNS shall be jointly responsible for scheduling and conducting an annual business meeting. The annual business meeting will likely take place during the week of the annual meeting of the National Academy of Neuropsychology, which is usually held in October or November. A second meeting may also be held during the week of the annual meeting of the International Neuropsychological Society (INS), which usually takes place in February. Other meetings and conferences may be scheduled throughout the year at the discretion of the Executive Committee depending upon the needs and customs of the organization. The Executive Committee is responsible for holding a minimum of four Executive Committee meetings per year. Such meetings may be conducted in person or by phone conference. The presence in person or by phone conference of the majority of the members of the Board of Directors will constitute a Quorum. Any number of Directors present at any meeting may adjourn the meeting. The annual business meeting and additional meetings called by the Executive Committee shall be conducted in accordance with standard parliamentary procedure. The Executive Committee composed of elected officers shall be the governing body of the Society. The elected Officers of this committee, terms, conditions and responsibilities of such these Officers are stipulated in Sections 1-7 of Article VI (Executive Committee). Membership and Elections Committee.1.1. This Committee shall examine applications and determine the eligibility of prospective HNS members. The Committee may conduct investigation for each applicant as it deems necessary or proper, including investigating any allegations of ethical misconduct.1.2. The Committee shall also review applications of HNS members who wish to apply for Fellow Member status and make recommendations to the Executive Committee for approval of such members. The Committee will oversee the Nominations and Elections process. Communications Committee. This committee is in charge of the creation and distribution, with the approval of the board, of the official communications of the Society. This Committee shall organize and maintain the electronic publications of the Society, including maintaining the HNS website and all social media. Mentorship and Education Committee. The mission of this committee is a) To encourage Spanish speakers to become neuropsychologists; b) To encourage neuropsychologists to develop competency in the assessment of Spanish speakers; c) To mentor HNS members in attaining board certification; and d) To provide mentoring opportunities to HNS members. Ad hoc committees and task forces may be established by recommendation of the Executive Committee and ratification by a majority of members present in the annual business meeting. Ad hoc committees and task forces may also be established or assigned by the Executive Committee throughout the year, between annual business meetings. Ratification by majority vote of all voting members of HNS will occurred via postal mail or electronic mail. Such committees and task forces will be appointed on a time-limited basis to carry out specific tasks without requiring an amendment of the Society’s Bylaws. Upon initial adoption of the Bylaws by the Society Membership, the Secretary shall date and certify a copy of the Bylaws. These will be maintained in the official records of the Society. A copy of the Bylaws will be provided with any amendments to all Members of the Society present at the annual business meeting. The Bylaws may be sent in advance of the annual business meeting via electronic mail or postal service. These will also be provided to subsequent new Members of the Society. Amendments to the Bylaws may be proposed by any member of the organization during the Society’s annual business meeting. Before they can take effect, such proposed amendments will require ratification by 2/3 of all members in good standing who respond to a mailed referendum sent via e-mail or standard mail. Proposed amendments may also be ratified by members who are present during the annual business meeting of the association, provided that 2/3 of all members of the Society are present at this meeting. The purpose of the HNS Student Association is to support the goals and mission of HNS as it relates to trainees and to increase visibility and awareness of HNS activities within its student members. The Student Representative (SR) and the Student Representative-Elect (SRE) will function as liaison members between students and the HNS Executive Board and Mentoring and Education Committee. The HNS Student Association will also provide training, mentorship, and leadership opportunities for students to further their professional development. The HNS Student Association will function in accordance with their approved bylaws and governance documents.